The company that brought us the PadFone, an all-in-one smartphone, tablet and laptop device, is thinking a bit bigger. Taiwan's Asustek Computer has now combined a tablet, smartphone and desktop PC into a single product that it calls the Transformer Book Trio. 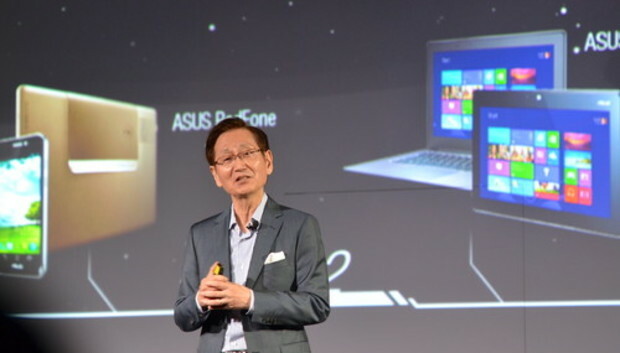 Asus Chairman Jonney Shih introduced the product during Asus's news conference at the Computex Trade show in Taipei on Monday. "Ladies and gentleman," said Shih, who loves to put on a show for the Computex press corps, "I present the Transformer Book Trio, the world's first three-in-one notebook, tablet and desktop PC." The Trio is an 11.6-inch Android tablet, with a 2GHz Intel Atom 2580 processor. Snap it into a keyboard and it becomes a laptop that can run both Android and Windows 8. Remove the tablet display, and the keyboard -- which has its own hard drive and Core i7 processor -- can be connected to a wireless monitor and used as a desktop PC. The tablet and keyboard each have their own battery, CPU and operating system, so while using the keyboard as a PC, "you can give the tablet to your kids to go play with independently," Shih said. The tablet has a 16:9 aspect ratio IPS display with 1920x1080 resolution and up to 64GB of storage, Shih said. Connected to the keyboard "dock station," which has its own 750GB hard drive, the device can "smoothly transition" between Android and Windows, he said. "You can access 700,000 apps in the Google Play store and over 50,000 apps in the Windows store, and they all run natively on the device," Shih said. He didn't give a price or a shipping date, but most of the products unveiled at Computex are on sale in time for the end of year holiday season. It's not clear how much demand there will be for the all-in-one product, but Asus is doing more than most companies to innovate around the PC and help it compete with tablets and smartphones, which many people are turning to for their computing. At last year's Computex, Asus introduced the PadFone, an Android smartphone that can dock into the back of a 10.1-inch tablet PC, giving it up to 64 hours of extended battery life. The whole device can then be docked onto a keyboard to form a laptop-like contraption. Shih is one of the more entertaining executives at Computex and enjoys playing the impresario and putting on a show. Each time he introduces a product, he takes time to walk across the stage, posing for photographs and saying, "Thank you, thank you, thank you." "We try to see the world the way da Vinci saw it," he said at one point Monday, flashing a sketch of the 15th Century artist and inventor on the big screen behind him.